January is most definitely a busy time of year for health clubs, but instead of getting upset about the crowded gym, here are five ways to cope. New year, new resolutions! For many of us this means eating right and regularly exercising, which often translates into crowded gyms and ultimately frustration if you can't work out how and when you want to. Especially at peak times of year, many gyms offer pre-registration online for group exercise classes, such as spinning or Body Pump, to prevent overcrowding or running out of equipment. If you want to secure your spot and avoid the crowds, be sure to take advantage of this service and register ahead of time. 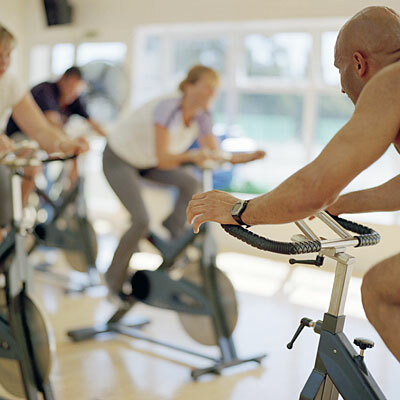 Many gyms impose time limits on cardio equipment during peak hours, which usually isn't a problem unless it's January and it's jam-packed with exercisers. Even though 20 or 30 minutes might not seem like a lot of time, you can maximize your workout with some high-intensity intervals, which push you out of your comfort zone and torch some serious calories in a short amount of time. Need some inspiration? Try this HIIT (High Intensity Interval Training) workout: 10-Minute HIIT Workout You Can Do Just About Anywhere. Ok, this is probably an obvious tip, but ask yourself: Is it possible to switch around your schedule this month to accommodate working out at a different time of day? If you always exercise after work, what about an early-morning or lunchtime workout when the gym isn't as crowded? Even if you moved just one or two of your workouts, you might have your choice of exercise equipment and avoid waiting for your favorite machine. With the gym being so crowded, you might not have the luxury of using multiple pieces of equipment at once, so make your muscles work double time by performing exercises that work several muscles at once. For instance, perform crunches on a stability ball to engage your entire core as well as your gluts and legs. The more muscles you can work at once, the more calories you'll burn too! Saturday (and Sunday) mornings are a great time to fit in a workout while the gym is still quiet. Most people like to sleep in on the weekend, but you can jump-start your day (and get your favorite treadmill) before the gym gets too crowded. How's that for starting your weekend off on the right foot?